Died 14 August 1904, at Wright, Ford County, Kansas. In 1850, at age 19, John Bowyer was living with the David L. Davisson family in Jackson Township, Indiana. He was apparently helping as a hired farm laborer. After John and Elizabeth were married, they stayed in Tippecanoe County until their first son was born. Then the family moved to Louisa County, Iowa, where they lived near Cairo for several years. Here, four more sons were born. About 1870, they moved to Crawford County, Kansas, and settled there until the late 1890s. 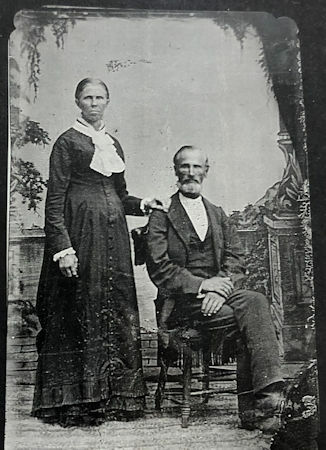 At that time, John and Elizabeth and some of their adult children moved to Ford County, Kansas, near Wright. They lived across the road from a son, Pem, and his family, until John's death. Members of the Methodist Episcopal Church, John and his wife were very religious. He taught Sunday School and they held Bible reading and prayer sessions every morning before breakfast. Frank Lyness enjoyed the Irish wit of John Bowyer. Elizabeth usually sat rather quietly when visitors came, but Frank always felt she was the strength and guidance of the family. He also said John was very proud of being an Irishman. The couple was very devoted to each other, and Elizabeth was grieved by her husband's death, the result of an accident on horseback. She then lived with a son, Riley, and his family, near Stark, Kansas until her death. Both John and Elizabeth are buried in Silent Land Cemetery, near Spearville, Ford County, Kansas. Married 25 March 1856, in Tippecanoe County, Indiana.